Blue Lily Commission - "In The Heart Of The Old City"
Blue Lily Commission is a solo project from musician and sci fi novelist Stephen Palmer, who you may also know as a member of Mooch. In The Heart Of The Old City is the follow up to Wine Songs (reviewed in AI #14), and serves up more of Palmer's space ambient ethnic music. It would be difficult to overstate the importance of percussion in this music, the rhythms and beats often standing equally prominent among the synths and ethnic stringed instruments. Imagine Manuel Göttsching teaming up with Shadowfax and you'll get a notion of what Blue Lily Commission is about. The CD opens with "Massive Strings Man". Dancey drumming and strained strings and drones set the pace for Palmer's Middle Eastern influences that also have dashes of hip-hop. The predominant melody lines have a slight dragged effect that's difficult to describe, but they give the song its character and are embellished by various drones and some spacey orchestration. Palmer later introduces one of his ethnic stringed instruments which creates a more overtly Egyptian feel. "Bendir 'n' Bass Club" is similar to some of my favorites from Wine Songs, recalling some of Manuel Göttsching's guitar and electronics explorations, though here we've got heavy doses of rhythm from Palmer's quietly intricate percussion. I love the combination of space atmospherics and almost salsa-like drumming. What seems like an odd contrast goes together nicely making for a unique sound. On "Acid Corrodes", pulsating sequenced electro percussion states the main theme as repetitive synth patterns and sounds slowly develop around it. There are also orchestral space washes that intermittently paint the landscape. But the percussion is the most prominent actor, creating a near techno feel that throbs, but still includes a sense of "drumming". "Chill-Out Courtyard" is another highlight, featuring pulsating high-pitched keyboards and a bit of a Rick Wright Floydish sound, quietly tinkling bells and percussion, and mucho trippy synths. The percussion doesn't serve a rhythmic role here. Rather, it provides little focal points among the meditative music. Dreamy landscapes, all-out space freakiness, and slightly avant-garde percussion makes for an enjoyably strange but mind expanding ride. And my favorite track on the disc is "Perpetual Loop Commission". Lots going on here. Steady dancey percussion, more of those Rick Wright styled keyboards, Church-like keys, flutes, Middle Eastern horns, ethnic stringed instruments, all amidst an uplifting cosmic atmosphere. Wheewww... it sounds overwhelming but it's easy to get peacefully lost. AI: What musical needs led to forming Blue Lily Commission separate from Mooch? Steve Palmer: It was a combination of three things that happened to come together at the same time. My wife bought me a new synthesizer (before, I've had to borrow keyboards for recording sessions! ); also, because I had moved from the east to the west of Britain, the incarnation of Mooch then playing was not able to continue - though I do keep in touch with the lads, especially Cal and Garry Lewin, and Pete Wyer. But I think the main thing was a desire to reduce the rather eclectic music of Mooch to a psychedelic core, removing many of the ethnic and dance/trance elements so that I could explore them properly with Blue Lily Commission. Mooch had become too diverse musically, I think. There's nothing wrong with diversity, it's just that, when I listened to the more recent recordings, they seemed too disparate. I set up Blue Lily Commission to separate classic-school psychedelic ambience and rock from new-school dance/trance. The name was inspired by the entheogenic plant the blue lily (sometimes called the blue lotus or the Egyptian blue waterlily). Recently there has been some fascinating research done on this rare plant, linking it with the culture of Ancient Egypt. I felt the plant suggested the sense of ancient and modern fused that I am trying to achieve with this new solo project: "future trance from an ancient world". AI: News at the peoplesound.com site says you've got a Blue Lily Commission performance scheduled in July. How do you handle live shows? Are you the sole musician or do you assemble a band? SP: With Blue Lily Commission, it's me and a backing DAT. I play live keyboards and guitar. Recently I did a short set at an SF Convention at which I was one of the invited guests; it went well, better than I had hoped, people either tapping their toes or lying on their backs chilling out... Some people think playing music like this is a bit of a con, but I see nothing wrong so long as there is some live element. Transglobal Underground and Loop Guru both used DAT's to underpin their many live performances. AI: Do you get to perform live much as either Mooch or Blue Lily Commission? SP: It varies alot. In 1998 I did a clutch of gigs with Mooch in the south-west of Britain, with various musicians. Last year I did none. Sometimes it's very difficult to find venues to play and people willing to give less commercial music a try. Luckily I know an organisation called The Future Sound Of Exeter and they have helped me with gigs in and around the city of Exeter. At the moment I'm trying to get gigs for Blue Lily Commission, but it's an uphill task. 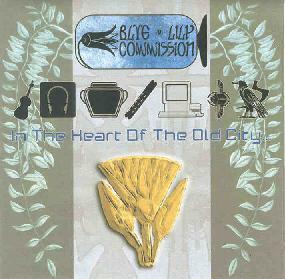 AI: I love the mixture of traditional ethnic instruments and keyboards on the Blue Lily Commission CD's. Tell me about some of the instruments you're playing. Can we expect more of this on the upcoming 'Seshen and the White Jasmine Commission' set? As a guitarist, I'm always on the look-out for instruments. 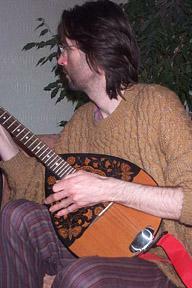 My favourite at the moment is the saz, a kind of long-necked Turkish lute. The strings are very fine metal, so playing it is a joy. It appears briefly on Harp from "Wine Songs", but I found recording it difficult because it is a quiet instrument. Now though I have a DiMarzio pick-up for it, so the saz will be present on a clutch of tracks on the new album. 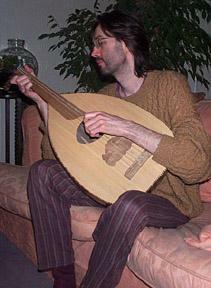 Most recently I bought a Syrian lute, but this has turned out to be much more difficult to play. The strings are nylon/metal and paired, but because the instrument is unfretted you have to have a different mind-set to play it, which so far I've not managed. It sounds great, though. Also I have a Spanish guitar, a Bolivian charango and a Greek bouzouki. I guess it's the miscellaneous items that most people find intriguing when they see my studio. Lots and lots of hand-drums and percussion, mostly from Africa, but also from India and the Far East. Most of these I bought at free festivals. Then there are the flutes. Simple flutes can be played if you are confident enough - not as a flautist would, but in a way to suggest flute sounds. I never claim I have mastered these instruments, but I can play them enough to suggest the cultures from which they come. Having said that, some flutes can be played by anybody, for example the bamboo ones I bought from Oxfam shops! Also there is a huge variety of reed-flutes that I have accumulated: snake-charmer flutes, Saharan flutes (the double-pipes of the desert people), and many crazy instruments made out of gourds that sound like buzzing bees in a jam-jar. These sorts of instruments sample beautifully because their sounds are so distinctive. It's even possible to make chord textures from them with the Mac by looping and layering; some of my basic samples I layer up to forty times to create huge textures. The beauty of all this is that, because the basic sounds come from real instruments and not off sample CD's, they don't sound like anything else. AI: How is the Spaceship Mooch project coming along? Give me an idea of what we can expect from this collaboration with Don Falcone. SP: Don sent me a copy of the mastered CD over the Easter weekend. I'm very pleased with his final version. It all started when Andy Garibaldi, who runs the Dead Earnest record label for whom Mooch record, suggested I contact Don about his Spirits Burning 2 project. I sent Don some music which he used to create his new work, but we felt we could collaborate more, so he sent me seven tracks that he had not used in other projects. After a couple of false starts I merged them with some of my own material to create three slices of what turned out to be rather dark and gothic ambience, rhythmic in places, elsewhere floating. Together with two solo pieces - one each - the album "Gothic Ships" was created. We are currently trying to find a record label for this project. I think it would appeal to all listeners of spacey music, especially those of a darker persuasion... I imagine it as the chosen listening of vampiric deep-space freighter captains. AI: What bands and styles of music have influenced you most, and are there any current bands or types of music that you find particularly exciting? SP: My musical influences have two main phases. The first was the music of bands and musicians I discovered as a teenager (twenty years ago now) of which the most exciting were Tangerine Dream, Klaus Schulze and Robert Schröder. Those classic albums from the seventies and eighties will inspire me for as long as I live, they make my skin goose-bump as I recall them now! - "Ricochet", "Rubycon", "Force Majeure" and "Exit", then Schulze's extraordinary run of albums from "Moondawn" to "Audentity", not forgetting Schröder's many albums, of which "Galaxie Cygnus A" is my favourite. Then in my early thirties I discovered Ozric Tentacles and The Orb. If I had to choose one band to call my all-time favourite it would be the Ozrics (though I'd rather not choose). I shall never forget walking into a record shop one sunny day to hear the strains of Crackerblocks floating out from the speakers. I was transfixed. At that moment I thought it must be music by Pat Metheny, but then the sales assistant showed me the CD artwork of "Erpland" and "Pungent Effulgent" and I knew I had to buy them both. Fantastic times. "Erpland" is surely one of the greatest albums ever made. The Orb were also a great influence for me, spearheading as they did the British ambient/alternative scene of the early nineties. Currently I'm listening to alot of synthesizer/North African fusion music - Omar Faruk Tekbilek, Steve Shehan, Prem Joshua, Natacha Atlas, alongside better known world artists like Talvin Singh (whose new album "Ha" remains baffling to me), Nitin Sawiney, and music from Peter Gabriel's RealWorld label. For me, cultural fusion is where it's at. Other recent purchases include Geddy Lee (I love all those Rush albums from "Permanent Waves" to "Power Windows"), Gong, Porcupine Tree, Roni Size and Steely Dan (I love everything they've ever done, and all the solo projects!). For me, the all time greats are: "Erpland", "Force Majeure", Schulze's "X", Yes's "Relayer", "Dark Side Of The Moon", Dan's "Royal Scam", Gong's "You" and Hillage's "Rainbow Dome Music" - timeless albums, and by no means the complete list. AI: You've published two science fiction novels... "Memory Seed" (Orbit, 1996) and "Glass" (Orbit, 1997), both dealing with environmental issues. Is the world blind or simply naive to the impact of what we're doing to the environment? SP: The older I get, the less I think we are naive. We do have the wisdom to see that what we're doing is wrong. I think too many people, particularly those who want political power, are blinded by their own selfishness. To paraphrase the SF author Douglas Adams, "those most attracted to power are those least capable of wielding it." The recent example of George W. Bush is a classic example of a man blinded to the truth of environmental damage by his background - oil in his case. We are as bad in Britain: Margaret Thatcher, to name but one example. It astonishes me to think that, in only forty years from now - less than two generations - Britain could have the majority of its power requirements met by offshore wind-farms sited on our gusty western coast. And yet we still drill for oil or import it from the Middle East. This is real blindness. AI: Do you foresee a gloomy or even tragic [near?] future in store for Earth? SP: Alas I suspect it will be gloomy and tragic - at least, for human beings. Earth and the life upon it are far too strong to be destroyed by mere people. I find the life and work of the British scientist James Lovelock particularly inspirational in this respect. He was the man who developed the Gaia theory. If we make the environment too harsh for our own race, there will be plenty of others happy to take over our environmental niche. Bacteria, to name but one. And insects, of course. AI: I see you have an online novel you're releasing in installments ("Hallucinating"). Is this an existing work you're releasing in parts, or does each installment appear as you've written it? SP: The latter. It started as a short story inspired by all the exciting and fascinating people I met when, in the early nineties, I started going to free festivals. The whole 'crusty/hippy/eco-alternative' sub-culture is full of amazing people. The five installments of part one were the original story, but then I got hooked and began developing it as a novel. This novel exists now as an outline, but time constraints mean I have only done the first two of the five parts. I jokingly say it will be ready around 2005. Really, this is a novel written for my music fans rather than my SF fans, which sounds weird, but that's how it developed. SP: I don't think online reading or even palm-computers will ever entirely replace the book. The book is one of those inventions that is so simple it can never be lost. People are still playing acoustic music even though we've had half a century of amplification. We've had typewriters for a century, computers for a few decades, but most people still write. A book is an object you can treasure as a single item - the cover, the paper, the author, the story itself. It's like a CD in that respect. I often wonder if MP3 music will replace the CD, record or cassette, but I doubt it. Those objects, like the book, are really only incarnations of a master object, a single item that you can hold in your hand and which means something to you. AI: Do you consider yourself a writer or musician first? Any thoughts on the differences in imagery communicated by the written word vs. music? SP: I can't separate what I do into categories, it's all one thing for me. I do sometimes find SF ideas leaking into musical work and vice versa. For example, the second album "In The Heart Of The Old City..." was loosely based on the feel of my forthcoming novel "Muezzinland" - and in that novel there are many references to futuristic music. With the written word I find myself trying to communicate deeper ideas, maybe ideas that need more thought - all my writing is based in environmental ideas. I do my utmost to recycle, support green ideas and green organisations etc. With music, however, it's much more an emotional thing - communicating something that hits the body, not the brain. I love music that sends a shiver down my spine, either through a fantastic melody or just because of the emotional impact of the music. AI: I see on your web site that you've also done the artwork for numerous CD covers. So you've got your hands in the visual arts, music, and the written word... covering pretty much all the main artistic mediums. What inspires you to communicate in so many different ways? SP: The CD covers all came from friends and other contacts in the music world, for example Andy Garibaldi and Pete Wyer. My parents are both artists, so I had an art-orientated background; we would go to art galleries, exhibitions, etc. But I am restlessly creative, I have to be working on some project or other. The world is so fascinating, so wonderful, there is so much to be inspired by, not least nature itself. My biggest problem at the moment is losing four days a week to go out and work so that I can pay the mortgage! AI: Any future news or projects we should know about? SP: Musically there are three main projects in the pipeline: the new Mooch album "Gaiaspace" which is to be released by Dead Earnest later in the year - Andy Garibaldi and I are deciding which tracks to include - and the forthcoming Blue Lily Commission album "Seshen and the White Jasmine Commission" which I began recording at the turn of the year. At the moment I'm not sure how it will be made available, but, like the first two albums, there will be some tracks available online as MP3's, either free or to buy. 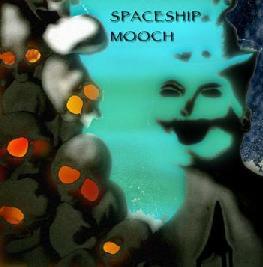 The third project is Don and my Spaceship Mooch collaboration, described above.